So—how to cook green beans simply and "slimmingly" could be a good thing to consider if/when you're trying to slim down a bit yourself. Although the ubiquitous stir-fry can be tasty, sometimes it's nice to drop some of that oil and sauce and get closer to the actual beans. My favorite method (which actually doesn't count as one of the "five ways") is simply to blanch the beans in lightly salted water for a minute or two...or even three if you absolutely must. Drain, and then serve hot with a little butter—or cold in a salad or with dip. Shazzam—a masterpiece and about as easy as it gets. But that doesn't fly with everybody, so here are some other ways as well. Whatever method you choose, though, please keep the cooking time short enough to preserve color, crispness, and nutritional value. If blanching as a cooking method doesn't make it, five other simple ways are boiling, steaming, sautéing, roasting, and microwaving. Given the prevalence of food-borne pathogens, please make sure your green beans are clean. If you grow them yourself, you lucky devil, simply rinse them a time or two and drain. 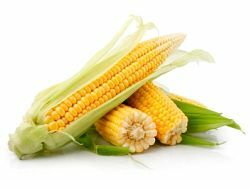 But if you buy them loose at the grocery or farmers market, please be sure to pick them over well before washing to rid them of grit and so forth. Then, snap each bean into two or three pieces—or leave them whole if they’re young and tender. 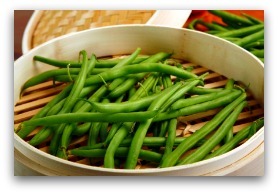 At the point when green beans become rather large and tough, consider giving them the French cut. Lay each bean flat on its side, and cut it in half lengthwise. Or use one of the cunning “frenchers” on the market. If you plan to use the beans in a salad or serve them at room temperature, prepare an ice-water bath to quickly cool he beans after cooking To make this "bath," partially fill a largish bowl or pot with water, and add ice. Under certain circumstances, such a step will definitely be worth doing, as it stops the cooking process immediately. During your final stages of pre-prep, fill a large pot with lightly salted water; then cover and set it to boil. When the water comes to a full boil, add the beans and set your timer for the *number of minutes you’ve chosen. When the time is right, drain the beans and either plunge them into an ice bath or serve. If serving hot or at room temperature, perhaps toss the beans with a little butter, olive oil, or even pesto. Unless you're using pesto, add salt and pepper to taste. Toasted almonds or pine nuts make a nice addition at this point, too. *Although cookbooks sometimes suggest cooking times of up to 5 to 6 minutes after the beans go into boiling water, you may want to test them sooner yourself—at 3 to 4 minutes, perhaps—just in case you're one who prefers a crispier green bean. For example, I never cook my own longer than 1 to 2 minutes...in fact, if they're to be a salad ingredient or part of a dish that will then be sauteed or baked, I might simply blanch them until they turn bright green and call it good. The best way to find out your own preference is with some trial and error. For this method, you'll need some kind of steamer basket, which you'll place into a saucepan with about an inch of water in the bottom. Bring the water to a boil, drop your beans onto the steamer, and cook 2 to 5 minutes (or 5 to 7 minutes for softer beans). Apparently, some cooks steam them in a frying pan, although I've never done so. To try it yourself, bring roughly a half-inch of salted water to a boil in your pan, and then add the green beans. Cover tightly, letting them cook until the water has evaporated and the beans have reached the tenderness point you prefer: I'm guessing 3 to 5 minutes. For someone with "bean tastes" similar to mine, however, it would likely be closer to 2 minutes. With either saucepan or frying pan, experiment until you get timing just right for your personal taste. If the beans are to be eaten cold or at room temperature, drain and pop them into the ice-bath. After the cool-down, drain them again and pat dry. If you want to serve them hot, omit the ice-bath. 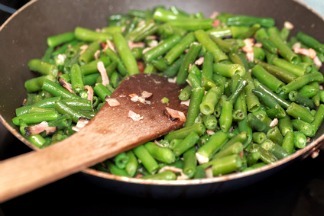 For a pound of green beans, heat a tablespoon (or under) of oil in a large skillet over a medium-high heat. Add a little chopped shallot or mild onion, if that's your thing, and stir until soft. Then, in go the beans. Cook, continuing to stir, a minute or so. Add a half-cup of water and cover. Let cook, stirring now and then, until they're crisp-tender. I'd guess that would be 1 to 3 minutes, depending upon your taste. Or, instead of water, you might add some diluted sauce of your choice, and cook uncovered until they're ready—stirring all the while. That's generally the way Chef Dan does it. And yes, we've drawn verrry close to stir-fry territory here. *If you prefer, line the sheet with baking parchment, and minimal greasing should be needed—if any. I love that stuff! Salt your beans very sparingly, and place in a microwavable bowl. 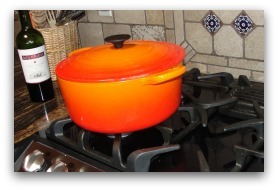 If the bowl has a vented cover, use that; otherwise, place the lid slightly ajar. Or you can cover the bowl with plastic wrap, leaving a small opening somewhere. Microwave on high heat for 1 to 4 minutes, or until the beans reach the degree of tenderness you prefer (if you’re using the ice-bath). If you're going to serve them hot, remove from the microwave slightly before they’re done, as they'll keep cooking for a bit. And now, you fox, you've just slogged through how to cook green beans five simple and pretty foolproof ways. In fact, any one of them could (IMHO) fit flex mode, which is why I like them. Plus, it's nice to lose the oil and sauces now and then and just taste the beans. Enjoy! *I will receive a small commission for products you purchase from Amazon as a result of clicking the link above. The material at this site is NOT medical advice, as I am neither doctor nor nutritionist. What I am is merely someone who's lived successfully on a vegetarian diet for many decades...and I transitioned from omnivore to vegetarian gradually. Please check with your doctor if you're considering big changes to your own diet. Also, be sure to find a dependable source of Vitamin B12. Copyright 2010-2019. Lynda Edwards. All rights reserved. *I will receive a small commission for products you buy as a result of clicking this link.